We have the pleasure to announce that booking is now possible for the heart screening day we are hosting in memory of Aaron Dixon. Available for anyone aged 14 to 35. Please go direct to the website to book your place. Appointments are FREE. However please remember, each appointment actually costs £75, fully paid for by donations, so if you book an appointment be sure to add it to your diary! Missed appointments still have to be paid for. 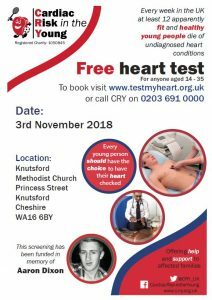 We have the pleasure to be able to offer this event to Knutsford residents with the kind help of Debbie Dixon who lost her son Aaron aged just 24 due to a genetic heart defect.